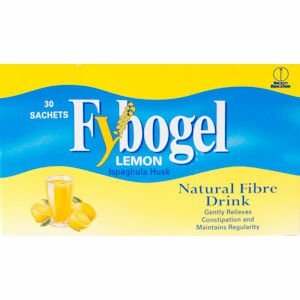 Fybogel Lemon high fibre drink is an easy and convenient way to increase the fibre in your diet helping your digestive system work more efficiently and gently relieving constipation the natural way. 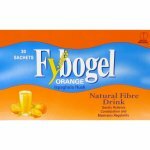 Fybogel Lemon works naturally with your body to treat constipation without undue straining, discomfort or unnatural urgency, so helping to restore and maintain regularity. Fill a glass with approximately 150ml (quarter pint) of cold water. Pour in the required amount (see dosage below). Stir well and drink straight away, preferably after meals. One sachet or 2 level 5ml spoonfuls of Fybogel Lemonin the morning, and one in the evening, or as prescribed by your doctor. Half - 1 level 5ml spoonful, morning and evening, depending on age and size. If there has been no movement after three days of treatment the doctor should be consulted. To be taken only on medical advice, half - 1 level 5ml spoonful, depending on age and size, morning and evening. Do not take Fybogel Lemon without water. If you accidentally take too much, drink plenty of water. If symptoms persist, consult your doctor. Do not take more Fybogel Lemon than directed. Do not use after the expiry date shown on the pack. Store below 30°C in a dry place. Your doctor has told you that you are suffering from a blockage of the bowel (intestinal obstruction or faecal impaction) or muscle weakness of the bowel wall (colonic atony). Your doctor has told you that you have phenylketonuria, because the product is sweetened with aspartame, which contains a source of phenylalanine. This may be harmful for people with phenylketonuria. High fibre products may interact with other medicines by altering their absorption. Check with your doctor or pharmacist if taking other medicines. Fybogel Lemon may be used during pregnancy and lactation. Ispaghula husk 3.5g, Aspartame (E951) and saccharin sodium sweeteners, potassium bicarbonate, sodium bicarbonate, polysorbate 80, silica colloidal anhydrous, citric acid and beta-carotene and riboflavine sodium phosphate colouring.